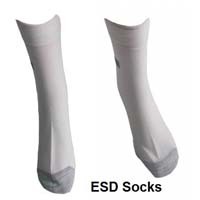 Antistatic socks to assure good contact of the leg and the ESD shoe. Unisex. Made with: 65% polyester, 30%cotton, 5% conductive yarn. Resistance: 10e6-10e9 Ohms. For different socks-please click on "more info"